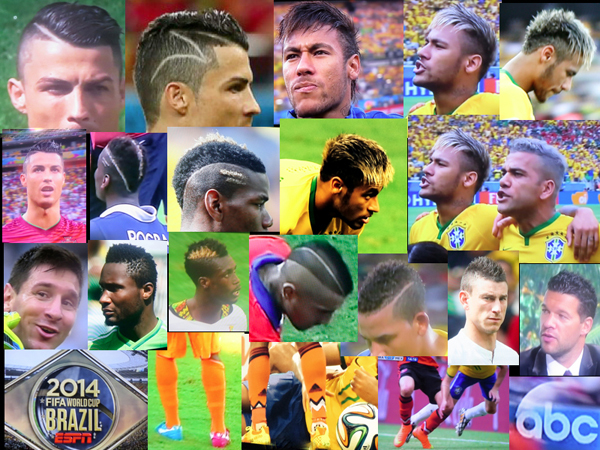 Home » Posts Tagged "Cristiano Ronaldo"
The men’s hair at the FIFA World Cup 2014 in Brazil scores. And how. Here’s just a few picks which should inspire many out there. Bottom Row: Couldn’t resist just a few socks, mismatched shoes and shoes in general. With thanks to both ESPN and ABC for their amazing camerawork and direction from whom I captured all the photos here except the zig zag one on Ronaldo, photographer unknown. Hot Hair: Parts here, there, everywhere … fades or tight, close-to-the-head sides, short hair, often rising up, and strategic color making an appearance, all are big news for men from the World Cup for 2014. Note on the quality of the photos. Not all good. I know. Taken with three cameras – Canon Elph Power Point and iPhone, better ones with Canon 5D. It is not easy to catch the moment with the right hair angle.